Years ago the legs of this fine early 20th century piece were cut off and over time the mahogany veneer had become dirty and nails had been driven into the joints. 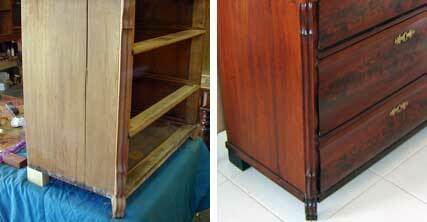 The nails and screws were pulled out and the chest was re-glued using hide glue. In fashioning the replacement legs, I took into account the client’s recollection of how the legs looked at one time, and also carried out my own research on the styles of legs on Biedermeier cabinets of the period. 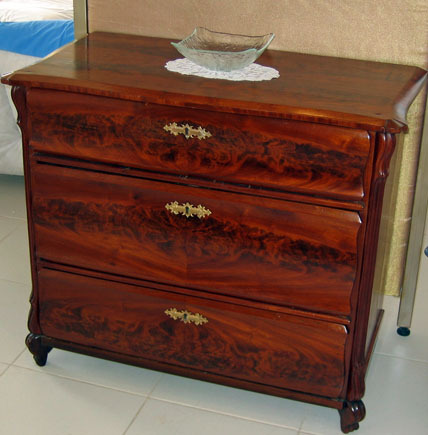 The mahogany color is natural so only French polish was applied to this beautiful piece.